I was ready to buy a Kindle almost two years ago. I liked the idea of such a light weight device to carry around my reading material. I travel quite a bit and read even more, so an e-reader seemed like the perfect solution. Then Barnes & Noble announced the Nook. Wait and see, I thought. So I waited and couldn’t make up my mind. Eventually I decided I didn’t want an e-reader at all. I love the feel of traditional books. I love reading books and then passing them on to friends and relatives. “Here! I’ve got a copy you can have. You’ll love it!” The thought of spending money on an e-book, reading it, and having it just sit there on my device forever doing nothing just didn’t seem right. After all, my mother was a thrifty New Englander. We spend our money carefully. But as a writer, I am aware of the growing popularity of e-books. And if I am writing for a medium, I want to be familiar with it. Somewhere along the line a radical thought occurred to me — it doesn’t have to be all or nothing. I can read some books on a e-reader and some on traditional paper. Additionally, I can borrow e-books from the library for free. All my reservations and arguments crumbled into dust, and I took myself off to my local big box store and bought a Kindle Touch. It seemed to have the features I want and is in the right price range for trying something new. My daughter bought a Nook Tablet today and my husband bought an i-Pad last month, so we intend to have “device wars” this week-end. Change is inevitable. Fighting it is futile. I am embracing change! 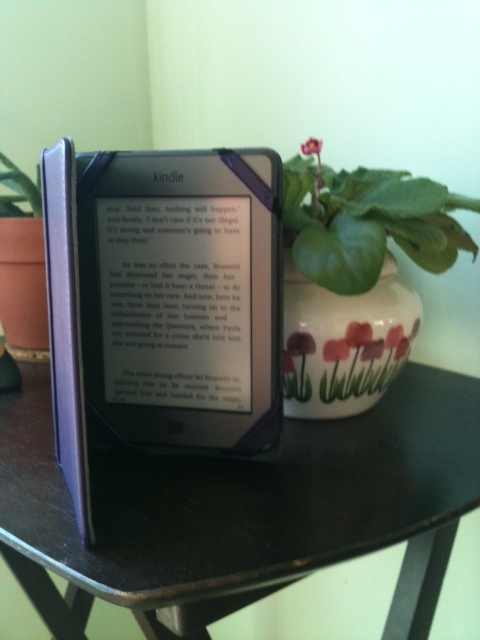 My new Kindle in its pretty purple cover. I’m not a technophobe but I resisted the whole electronic reader for a long time. Even after I published my own novel and a short story on Smashwords and Amazon. But I’m retired and living in Panama so buying a reader was a bit of a problem. Getting it shipped down here to a place where there’s no home mail delivery plus import fees, etc. But when someone posted on a local forum that they were coming down for a vacation to a city nearby where I lived and wanted to know if they could bring anything down for anyone I jumped at the chance. I ordered a Kindle, had it shipped to their home in the States and they brought it down in their suitcase. I absolutely LOVE my Kindle. First of all, the availability of English-language books here is very limited and the cost when you can find them is unbelievable. Also, being on a fixed income, I download a ton of free books from Amazon and have discovered some really good writers. The one thing about the Kindle and the free books you can get is if an author doesn’t capture me in the first few chapters I can dump the book and I’m not out anything except the reading time.